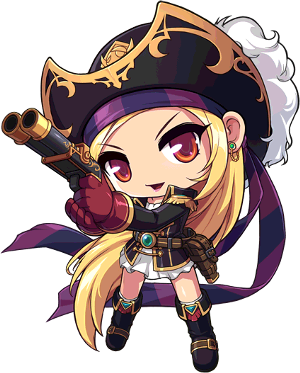 The path of the Pirate is a popular path in MapleStory. There are three types of them: Corsairs, Buccaneers, and Cannon Masters (Cannon Shooters/Cannoneers). Note, Cannoneers have their own character creation button. Gunslingers are faster and ranged attackers. Brawlers are melee, close-ranged fist fighters who deal lots of damage and have high HP, but they must get extremely close to their enemies and thus tend to take a lot of damage. Cannoneers are ranged, like Gunslingers, and even share a few movement skills. They have powerful but sort of slow attacks. The third job is forced, depending on what has been already chosen: Outlaw from Gunslinger, Marauder from Brawler, and Cannon Trooper from Cannoneer. For the 4th job, Outlaws become Corsairs, Marauders become Buccaneers, and Cannon Troopers become Cannon Masters. Very fast attackers, Gunslinger confirmed as faster then Assassins and Brawlers with comparable speed to Bandits. Interesting abilities, as well as getting a mob attack during first job. Gunslingers can hover in the air for a short period of time. In first job, pirates have a useful dash ability that can accelerate movement speed. In the Brawler job, the user has physical mob attacks. Brawlers have more HP than Bandits and more MP than warriors. Gunslingers do low damage earlier on. A little bit difficult to get used to, very different than other jobs. The Float ability is not so useful if trying to get out. The pirate equipment is a little bit expensive for a beginner. Brawlers lack the mobility of Bandits, and also must be closer to attack. Being new to Maple means that you will need some guidance. In this case, you will raise a future Pirate, meaning that you will need correct stats. As you will see further, the most necessary attributes for this job would be STR and DEX, depending on your job. INT and LUK should be left at 4. If you want to build a Brawler or Cannoneer, it is recommended to put all of your AP into STR. Meanwhile, if you want to build a Gunslinger, it is best to put all of your AP into DEX. After creating a new character and starting as a Beginner, do all the quests in Maple Island and level up to the required level to make your job advancement. Eat an apple to restore your health (this quest levels you from 1 to 2). Walk to the right and speak with Cutter, an engineer trying to perfect the ultimate weapon for pirates to help escape the island. Kill Starfish and collect materials for Cutter. Get the ignition device from the small island. Launch to Victoria Island via the Cannon. Upon arrival at Victoria Island, talk to Olaf and pick your job quest. Take the taxi to Nautilus Port and enter the submarine in the center of town. Walk to the right and enter a door with an "UP" arrow over it. this will take you to the top deck of the ship. Now, walk left and enter the farthest door. Inside is the bridge, where Kairin is located. Talk to Kairin and make the job advancement. If one plans to be an Brawler, consider using your first point in Quick Motion. It adds Accuracy, which is very important for the physically attacking infighter. If one plans to become a Gunslinger, work on Double Shot or put your first point into Dash for increased mobility. See Training locations for where to power level. When you reach level 10, head to Nautilus Harbor. Enter the Nautilus, and head to the top left of the map. Speak with Kyrin and become a Pirate. Kyrin will give you both a Scallywag Knuckler (knuckler) and a Pirate's Pistol (a gun). Both items are Pirate only and unable to be traded. When you awake from the launch, you'll find yourself in a cabin in the Nautilus. Cutter will inform you that the rough landing was caused by the monkey who snuck on board. Since the monkey likes you so much, he gives you a propeller kit to give the monkey, who then becomes your side kick. Cutter will tell you to speak with Kyrin. 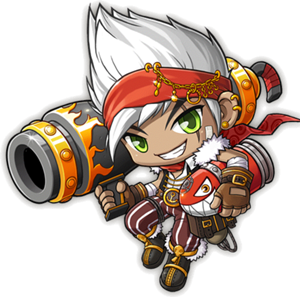 After telling you about pirates, Kyrin will upgrade you to a Cannoneer. Go see Kyrin in the Nautilus at Level 30. She will say that you look much stronger and ready for 2nd job, and will give you two quest choices, one that leads to the path of a sharpshooting Gunslinger, or another that leads to the path of a fierce Brawler. Once you accept one of the quests, she will send you to a secret area, where you have to defeat OctoPirates and collect 30 Dark Marbles. They don't give any experience or drops except the Dark Marble. Once you are done, exit the map through the portal. Take the 30 Dark Marbles back to Kyrin and you will advance based on which quest you picked. Note, Cannoneers have their own quest, with the same directions. Once you are level 60, go to El Nath, and head to the house on the big hill (Chief Residence). Head to Pedro, and talk with him. After a chat, head to Sharp Cliff I. Go inside the crystal portal at the bottom of the map. Double click on the Holy Stone at the bottom. Head inside, fight Kyrin's evil side, and head out with the Black Charm that it drops. Deliver it to Pedro, and you will advance to third job. Congratulations on hitting 100! Once you hit level 100, Pedro the 3rd job instructor will contact you via lightbulb. After starting the quest, head to Leafre and talk to Samuel in The Forest of the Priest. You will then get a quest to obtain two special items for the fourth job instructor to advance. You will have to kill Manon and Griffey to get the two items, but thankfully, they're special versions of the bosses, which you will find instantly upon entering their respective boss map. Note, they don't drop any of the items the real versions do. After hunting down these monsters and obtaining the two items, go talk to Samuel. He will advance you to fourth job, give you the skill book for Maple Warrior 10, and give you 4 SP and 5 AP. This page has been accessed 513,321 times.